For a hotel to stay relevant, it must, like a shark, move or die. 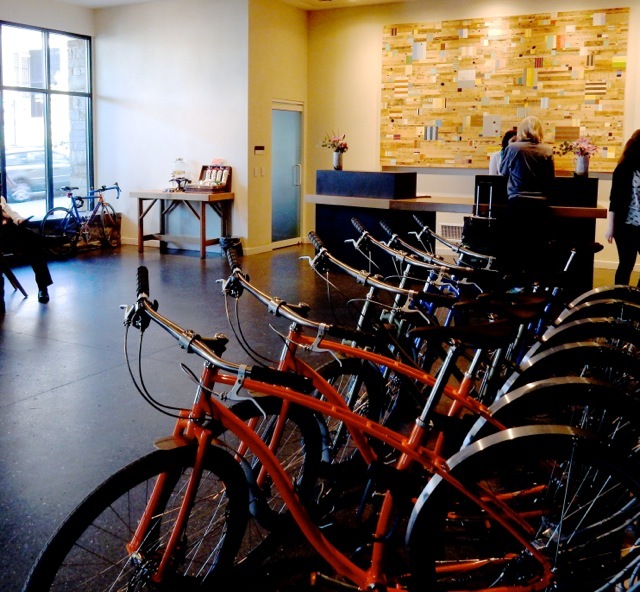 "Moving" in the lodging world, means constant renovation, or at least cosmetic refreshing. Most of the following hotels and inns are brand new, but some, like the Emerson Resort, Ocean House, Four Columns Inn, and Inn By the Sea keep a watchful eye on design, color palette, and programming: changing when needed to fit new times and tastes. Though the list can vary by the day, the following dozen lodgings throughout the Northeast USA are among the best new and renewed boutique hotels and inns to open or reopen within the past few years. For more on each hotel, and other great destination ideas in the Northeast US, check out GetawayMavens.com. 1. 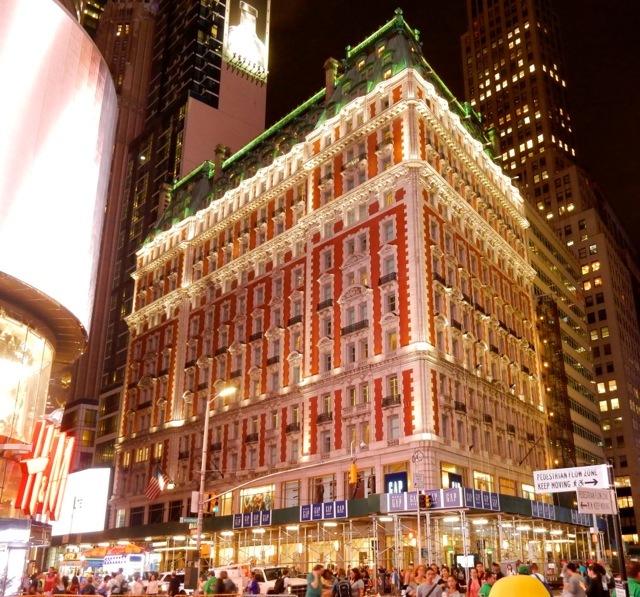 Knickerbocker Hotel, NY NY: The original Knickerbocker Hotel was built, in 1906, by John Jacob Astor IV (who perished on the Titanic) as a magnificent celebrity hangout, and became what would have been a TMZ darling - the place where notables of the day went to see and be seen in the newly developing Times Square (the wedge of Manhattan real estate named for the New York Times Newspaper building, built in 1904). Presidents Teddy Roosevelt and Woodrow Wilson, Carrie Nation, Anna Pavlova, William Randolph Hearst- all stayed here. Enrico Caruso, Mary Pickford and George M. Cohan were residents. The Knickerbocker Bar, with its Maxfield Parrish mural, hosted A-listers, and the restaurant served some of the best meals in town. The Knickerbocker closed abruptly in 1920, some claim due to Prohibition and the increasing value of office space in that section of NYC. The building was subsequently used as headquarters for Newsweek from 1940-1959 and then retail space and housing units before being completely renovated a couple of years ago with its stunning Beaux Arts exterior intact. Red brick with terra cotta trim, the structure is a standout in Times Square amid the flashing lights of surrounding Jumbotrons. Inside, the lobby is spare and rooms, in mellow Asian meets Danish decor, are immaculate and minimalist, devoid of art or any punch of color. Each chamber features blond wood furniture, ultra-comfy platform beds topped with white duvets, and are super-soundproof - a key ingredient in the noisy center of a 24/7 city. 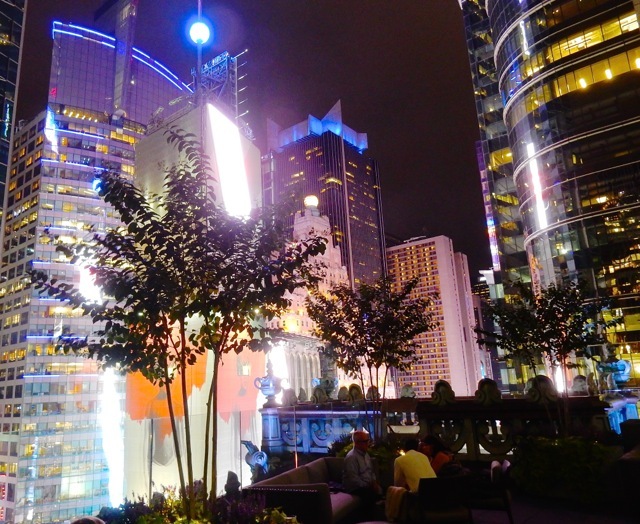 If you've been to many rooftop bars, none compares with St. Cloud at the Knickerbocker. More than 16 stories high, within direct view of the Times Square Ball that descends on New Year's Eve and the flashing lights of the surrounding mega screens, this quiet spot is a treat and revelation. Even if you are not staying here, having a drink here pre or post show is a must-do. 2. AKA Wall Street. NY NY. AKA Wall Street, an extended stay "hotel residence" carved out of a 1907 brick and limestone office building, opened in June 2016. In the newly developing Financial District, AKA Wall Street is that rare lodging that combines understated luxury, attentive service, sleek modern design, a residential feel, and opportunities to engage in community life. Designed in natural materials and light earth-tone palette, the lobby is so minimalistic it's quite the shock to walk in from the pageantry outside. Service is personable, whether you're returning for the 25th day in a row or coming in for the first time. Unlike the more typical traditionally furnished long-term stay hotels, each suite at AKA Wall Street could be mistaken for a Knoll showroom, with clean lines, wide plank white-oak floors, mid century modern furniture, frosted glass sliding doors to gleaming glass-tiled bathroom (with large rain showers and ample light), abundant space for clothing and personal items in a massive closet, and two large flat-screen programmable TV's (in one-bedroom suites). Comfy beds are handsome and crisp in white duvets, eggshell-colored sheer curtains swish aside to reveal the canyons of commerce outside large windows. Modern Italian-designed galley kitchens are stocked with pots and pans, tableware, cutlery, glasses, induction-heating stovetop, microwave oven, Fisher-Paykel dishwasher (dishwashing pods provided! ), small fridge and ample counter prep room. What makes AKA a residence hotel and not a series of apartments? There's a good-sized fitness center, a rooftop indoor-outdoor lounge with fantastic views, evening wine and morning coffee for guests, an outdoor landscaped terrace, and AKA's unique, immersive LiveIt Program, offering guests opportunities to really delve into the surrounding neighborhood - e.g. Wine Tastings, Cooking Classes, Dance, Photography lessons, Improv Comedy and more. One of these is a fantastic wine-tasting at the new Eataly Downtown NYC, just a five-minute walk away. Even if you don't intend to dine there, Eataly is an attraction in and of itself and the perfect place to pick up wine, cheese, breads and other picnic or recipe ingredients to whip up a quick meal in your AKA galley kitchen. Book a table at Osteria della Pace, the most upscale eatery in Eataly, and as guests of AKA Wall Street, you'll receive extra special VIP treatment. Excelling in homemade pastas and inventive tweaks on Southern Italy cuisine, with picture window views of those canyons of commerce, a radiant bar, toothsome wines from Italian family vineyards, and attentive waitstaff, Osteria della Pace is a new downtown NYC hotspot, and deservedly so. 3. 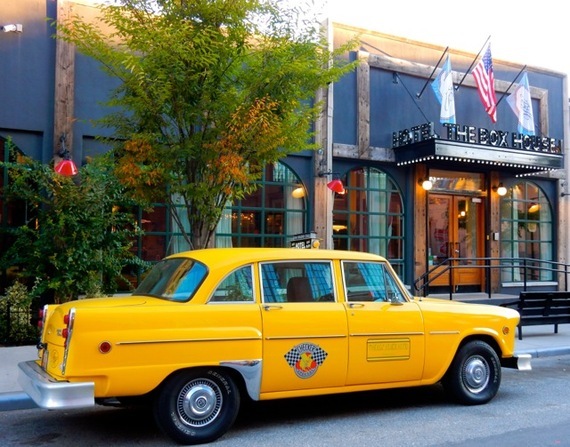 Box House Hotel, Brooklyn NY: You can't miss the Box House Hotel with its white and yellow 60's Checkered Cabs at curbside. These vehicles await guests who need a (complimentary) ride to subway stops or restaurants within a mile radius - just one guest perk among many. The Greenpoint section of Brooklyn's first boutique hotel, the Box House was in its former life a door and window factory, gutted, renovated and opened as a 56-suite hotel in 2010. One of the top places to stay in all of Brooklyn, all apartment-sized chambers are outfitted with fully-stocked kitchens, sitting rooms and ample closets. The expansive lobby is wild with color - mostly due to stained glass windows and the vibrant art of interior designer, Kip Jacobs, here from abstract saturated color panels to the more realistic bird prints that adorn the halls. Jacobs also has a whimsical way of juxtaposing random antiques and knickknacks throughout the properties. Tchotchkes abound. Skee-balls stacked in terrarium boxes, empty antique milk bottles jammed in crates, globes, manual typewriters, old cameras on desks, and the like suggest a bountiful weekend in Brimfield or an afternoon at Home Goods. Employees are well schooled in upscale service without an iota of snooty pretention. Check-in is easy, friendly and really chill. Need a ride? No problem Need a dinner rsvp? Here's where to find a whole slew of restaurants within walking distance. Want to just hang out in the lobby with a glass of wine from the in-house bar/restaurant? You won't be alone, and you'll probably make some friends. Two other Brooklyn Boutique Hotels owned by the same group- the Franklin Guest House and Henry Norman Hotel - are nearby and offer identical amenities (chauffeured cars) and art by Kip Jacobs. 4. 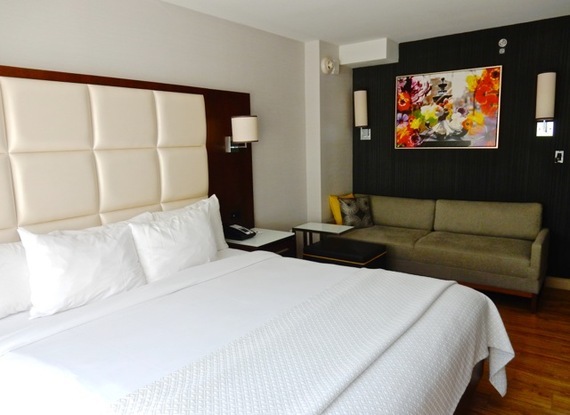 Cambria Hotel and Suites New York - Chelsea, NY NY. Sure there's a trove of hotels to choose from in NYC and in the Chelsea district alone, but this one places you squarely in the center of the Chelsea Flower Market on 28th street, a block from FIT on 7th Ave, and a 10 minute walk to the Highline. The hotspot Rooftop Bar offers a birds eye view of this slice of NY, and draws sun soakers on warm summer days. Tall and very narrow, the Cambria/Chelsea features only 8 rooms per floor, so one would imagine that at this scale, guest-rooms would be pod-small. But each clean, modern, bright, minimalist styled chamber is actually spacious by Manhattan breadbox standards, especially for its midlist rates ($209-$460 depending on day of week and season). Each room, in a handsome grey and wood palette, features hardwood floors, large flat-screen TV, mid-century modern seating, a smoked glass top desk with ergonomic chair, leather ottoman, a decadently comfy quilted-leather headboard bed topped with a pillowy duvet, and one vibrantly colored poster-sized canvas photo for pop. 5. 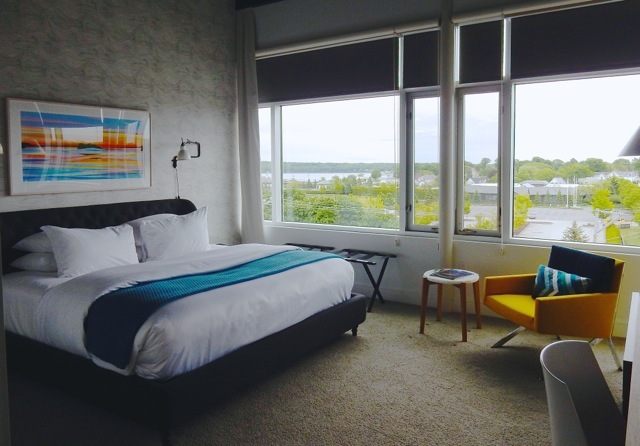 The Time Hotel, Nyack NY: Nyack NY has a cool new venue, and its turning this artsy but sleepy burg, 20 miles north of Manhattan up the Hudson River, into a "beautiful people" destination. 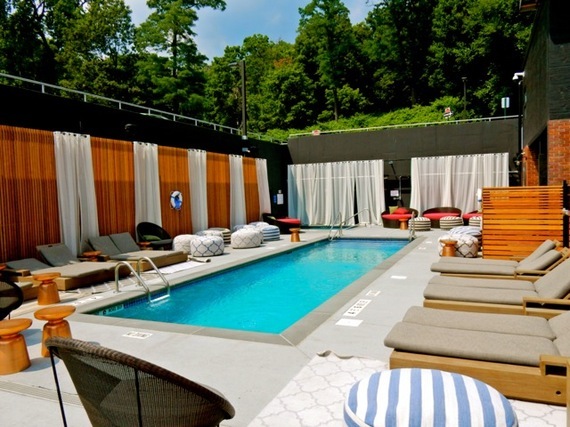 The Time Hotel, opened in May 2016, is a big-dog-friendly, 133-room Industrial-chic inn - hard by busy I-287 - and by virtue of its edgy decor, would not be a fit for the average Best Western fan. You have to be the kind of traveler who appreciates Damien Hirst-esque glittery (and woven) skulls, purposely-unfinished concrete walls, dangly crystal lamps, and recurring-Rorschach-inkblot wallpaper - all together, a kind of Baroque-meets-Modern motif. Walk through red castle-like doors into a dark lobby; its black polished concrete floor offset by colorful tufted seating, "Oriental rugs" woven with skulls, and Rock and Roll portraits like "Mick Jagger With Red Lips" (artist, Russell Young) shot through with diamond dust. Raw brick walls and exposed ductwork hark back to when this building was a plastics factory and warehouse, and that cool vibe extends to reception staff who are friendly and efficient, but not overly fawning. 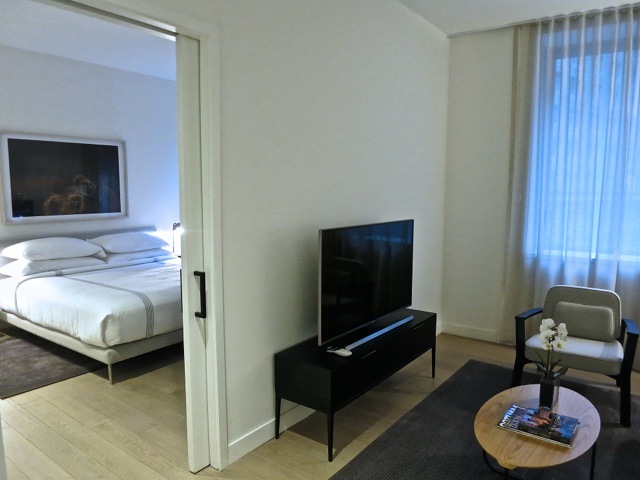 If you have great appreciation for out-of-mainstream contemporary design, as long as it comes with a dreamy bed (check), large flat-screen TV (check), large bathroom with shower, stand-alone bathtub, and ample lighting (triple check), you will love this place. 6. Emerson Resort and Spa, Mt. Tremper NY. Emerson Resort and Spa in the Catskills, is named after poet Ralph Waldo Emerson, and excerpts of his poems can be seen throughout the property. 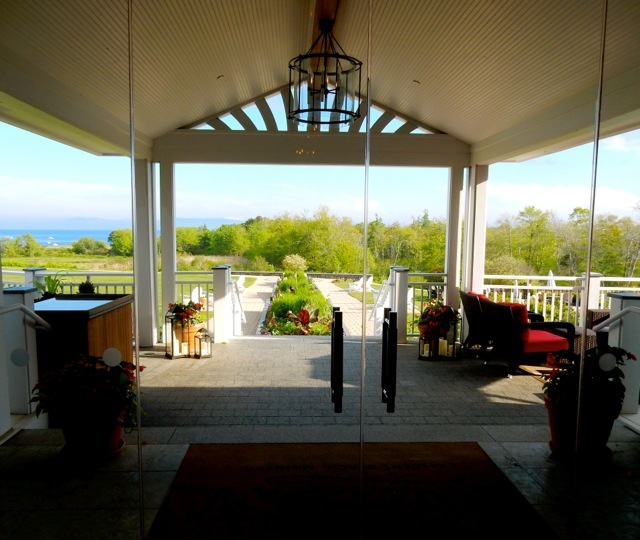 In 2007 the Inn portion of Emerson Resort was rebuilt next to the existing Lodge, incorporating the façade of the Risely Family's Dairy Farm house, local bluestone, and lots of antiques and artifacts from India and the Far East. Just emerged from a $6 million renovation in 2016, most of the antiques and Asian furnishings are gone (except for the ornate wood door that serves as entrance to to Spa), leaving public areas and guest rooms newly bright and modern. Emerson Resort is both classy and serene and for those looking for a luxurious home base from which to hike, bike, ski and otherwise explore the Catskills, it's a self-contained treasure. To top it off, it's Dog Friendly. While the resort is actually made up of several establishments; the 26 room Inn, the 27 room Lodge, and an enclosed shopping mall - the Emerson Country Stores containing the World's Largest Kaleidoscope, the Inn is the most luxurious with a lobby enhanced by stunning original works of art by local artists. 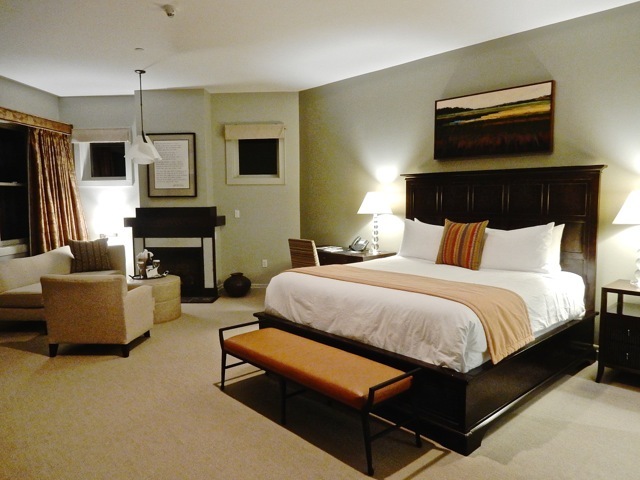 Spacious suites have been updated in earth tones, with clean-line furniture, flat screen TV's, gas fireplace, and a bed you don't want to leave in the morning. Bright marble bathrooms are outfitted with rain showers featuring iridescent mosaic tile, and a tub perfect for apres-hike soaks. On site Woodnotes Grill is true stream-woods-farm-to-fork fare, described as "Catskill Creative Cooking," inspired by the Hudson Valley, and now worthy of a top-notch inn. 8. Frederick Inn B&B, Buckeystown MD. The exuberant and warm Pat and Kirk Horstman, on a ten- year quest to find the perfect B&B in the perfect "self-sufficient" town, discovered what was a somewhat disheveled place and loved its 1897 "bones." After a complete renovation in the summer of 2015, the Horstmans opened their dream home as The Frederick Inn B&B. Now, it's such a true serene escape, I recommend the Frederick Inn B&B for a Honeymoon, Babymoon, Supermoon, Harvest Moon - in fact, for any and all phases of the moon. It is that beautiful. Pat hired Frederick's Tuscan Blue Design to decorate the home. The result showcases the highlights of the architecture but not in a glitzy, fussy way. Public areas are uncluttered and elegant, wood floors burnished to a gleam. And those rooms...Magnificent. The Horstmans source ingredients from a local CSA, and fresh-roasted Fair-Trade coffee from Miss Mary's Perfect Roast down the street. So, basically, the marvelous 3-course gourmet breakfast is a farm-to-fork meal. 9. 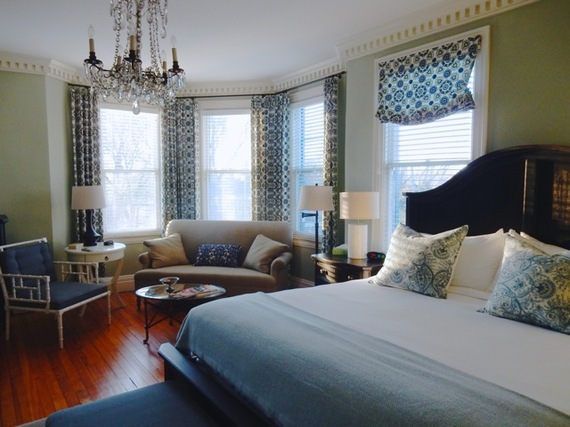 Hotel Vermont, Burlington VT. Only three years old, Hotel Vermont, a chic boutique, is everything an upscale Vermont hotel should be: environmentally conscious, with judicious use of natural elements in a cool, eye pleasing décor. And this being Vermont - where locals take beer seriously - Hotel Vermont claims its own "Beer Concierge," who arranges day-long Vermont Craft Brewery Tours, lets you in on the where's and when's of the latest Heady Topper deliveries, and will map out the most convenient way to try out all of Burlington breweries. You'll see the bikes first - lined up in the lobby for guest to use. And then, behind a small reception desk, manned by smiling and ever-helpful staff, Hotel Vermont's logo writ large - a Mondrian-like composition of inlaid wood of various colors. Incredibly, this piece was constructed by artist Duncan Johnson from the debris wrought by Hurricane Irene when it blew through Vermont, reducing houses and barns to matchsticks. Not a touch of paint was added to any piece of salvaged wood, so what you see is a splinter of a home, a sliver of a livelihood, in its original color: Beauty created from tragedy. 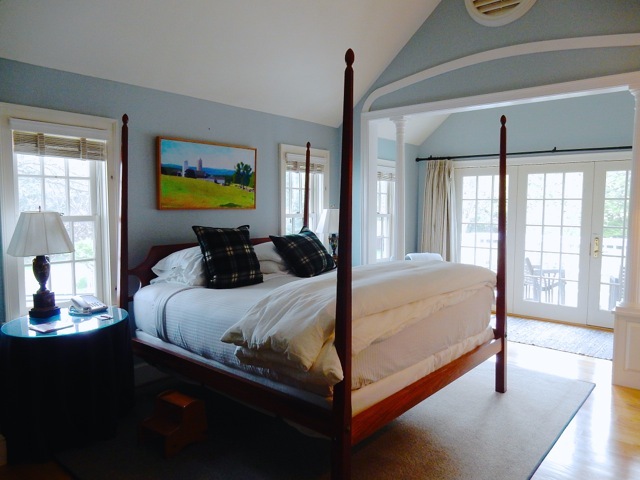 Rooms are fresh and contemporary - blond woods, leather seating and an incredibly comfortable pillow-top bed clad in requisite white duvet punched up with color by an orange felted bolster and Vermont Flannel Co. throw. 10. Four Columns Inn, Newfane VT. The Four Columns Inn, an iconic, whitewashed 16-room luxe "Country Inn" a dozen miles from Brattleboro in the classic whitewashed New England town of Newfane VT, was shuttered in 2013 and reopened, afresh, in mid 2015. 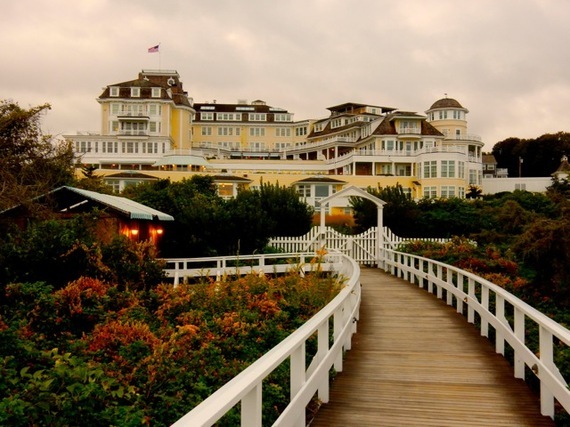 Once enchanting enough for the likes of Mick Jagger (who stayed over for his 40th birthday), it had fallen off its imperial pedestal, and was purchased by Greenwich Hospitality Group (which also owns the Delamar Hotels in Greenwich and Southbury CT). After a complete refurbishment, the very upscale Four Columns Inn is regaining its past allure. Food in the on-site restaurant, Artisan - décor a marriage of French Country and American Tavern with contemporary flourishes - is far from your ordinary farm-to-table fare. And most surprising, cost is reasonable for this level of dining experience. This is no mistake. New owners have learned from the past, when prices were astronomical and locals were turned away if they showed up just to have a glass of wine. Now, nearby residents are embraced. Food is inventive, lovely to look at and yes, amazingly good. 11. Inn By the Sea, Cape Elizabeth ME. I've been writing about this environmentally conscious, dog-friendly, 61 room luxury seaside hotel in Cape Elizabeth ME for years, and each time I visit, it just gets better. My first review, in 2008 read: "Grand, but not grandiose, Inn By The Sea keeps both top-notch luxury and eco-friendly practice sacrosanct. To top it off, it's big-pet-friendly. Sitting by the fireplace in the bar, you'll hear the clip-clip sound of greyhound, lab or retriever pawnails on polished marble; guests and their charges checking in." 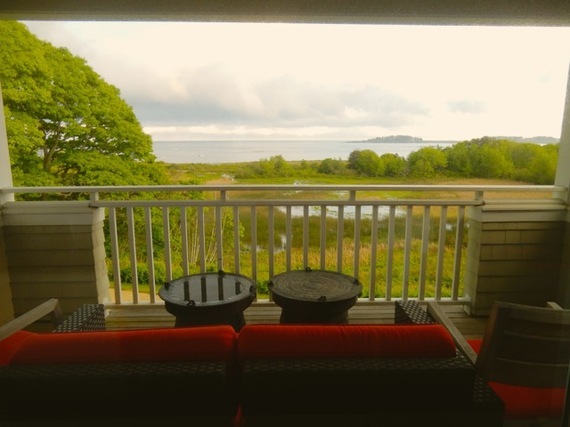 In fact, Inn By the Sea is one of the most luxurious, upscale, Big Dog Accommodating hotels in existence, and the owner's adoration of canines goes way beyond allowing Fido on the property. While I checked in last (summer 2016), a couple from New York was in the process of adopting a pup napping behind the reception desk. As an arm of the Animal Refuge League of Greater Portland (Maine), Inn By the Sea fosters and facilitates adoptions of rescued dogs. This was the Inn's 54th dog to find a forever home. "We keep one dog at a time on site, and people come and fall in love with them," said an Inn By the Sea employee. "Old, blind, no teeth; they all get adopted." Visiting dogs here are just as spoiled as their humans. There are Dog Spa Treatments and a special Dog Menu ("Meat Roaff," "K-9 Ice Cream") for treats and food. On-site Sea Glass Restaurant is destination dining at its best. Not only is the food excellent - lobster dumplings, smoked corn chowder, seared scallops topped by handpicked micro-greens - but the views are incredible both inside and out. Yes, you can peer at gardens, bogs, salt marsh and a slice of sea from the cozy dining space. But you can now also study a series of paintings and lithographs, the likes of Chagall and Matisse, that were recently installed on the walls: a cultural experience for all the senses. 12. 250 Main, Rockland ME. Ever since it opened in May 2016, 250 Main has won raves from guests, and it's no wonder. Like any great boutique hotel, design elements are not only pleasing to the eye, but to the body and heart as well. The hotel's owners, Cabot and Heidi Lyman, who also own Lyman Morse Boatbuilding, employed workers from their boatyard to construct the hotel. Evidence of yacht design, building and structural elements can be seen throughout each of five floors. An "in-town" hotel, there are no sweeping lawns or pools, but you won't care about that when you walk into the lobby, done up in creams, mustard yellows and mink browns punched by vibrantly hued contemporary art. Modern, Italian-made seating and locally reclaimed wood tables (sourced from salvaged boats) entice you to sit by the glass fireplace for a glass of wine (offered complimentary after 4pm) and conversation. Look up to see dark brown I-Beams juxtaposed with distressed wood-boards overhead -homage to different eras of boat building. Rooms, in a word, are stunning. Masterfully decorated, they come in a variety of sizes all with mid-century modern furniture in bold punchy colors. Rooms on 5th floor feature soaring 14 ft ceilings clad in brown steel I-Beams and walls of windows overlooking the harbor. But the piece de resistance is the billowy bed, a bed you never want to leave, topped with a downy white duvet and teal throw - pure heaven.